This was absolutely brilliant. It's not often that you see a little subtitled Norwegian film get a world wide release. A group of film students start making a documentary about some recent bear attacks but it turns out there's more too it than that and the government are hiding secrets deep in the Norwegian woods and mountains. It's a "found footage" style film with the footage taken by the students shown as is. It's one of the best examples of this style I've ever seen. Thanks to the likes of Blair Witch and Paranormal Activity this style is mostly associated with horror. 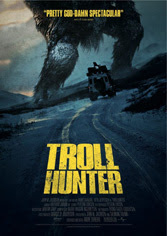 Troll Hunter gets lumped in to the horror genre as well but it really doesn't deserve it. Other than some mild suspense and a couple minor jumps it's really not that kind of film. It makes you believe that troll could be real. You mean there might be people who think trolls aren't real? I would like to see this, it sounds good.